To understand the philosophy of Lord Krishna, it is imperative to have a close look at his life and what all he stood for. The first major political event in the life of Lord Krishna occurred when he killed his maternal uncle, Kansa. For slaying of Kansa there were many reasons, personal and political, both. Kansa was an unjust king who had begotten the throne unjustly by imprisoning his father, Ugrasena and had also incarcerated his sister and her husband. He was a proud king who cared little about the welfare of the people. He was interested only and only in perpetuating his rule. Kansa selfishly pursued the permanence of his rule with ready assistance from Jarasandha, the equally tyrannous ruler of Magadha and a relative of Kansa by marriage. Kansa’s unjust rule resulted in factional discord in Mathura. However, Kansa, being a very powerful and cruel king, was not easy to be overthrown while the populace under his rule continued to suffer. Finally, as prophesized, Kansa was slain by Lord Krishna, who then gave the kingdom of Mathura back to its original ruler, Ugrasena. Overthrowing the king is permissible as per the Supreme Law (Dharma) only if the king is unjust and tyrannous, which Kansa certainly was. Therefore, killing him to take the kingdom from him was very much in line with the principles of righteousness. 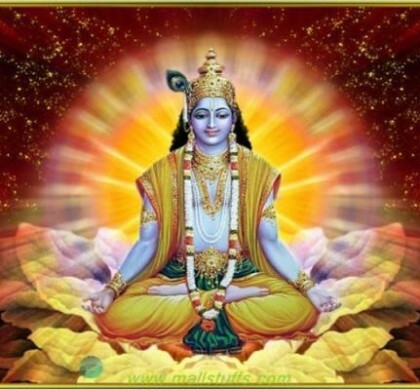 However, since Krishna was not a king himself, it would have been improper for him to take the throne. Therefore, the original ruler and father of Kansa, Ugrasena, was given his kingdom back. 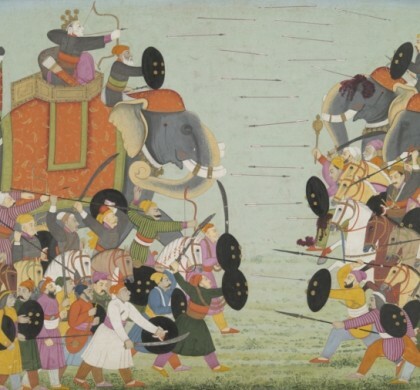 The second major event was the killing of Jarasandha, who had repeatedly attacked Mathura unsuccessfully after the death of Kansa, his son-in-law. However, the ability to offer armed resistance to the attacks was severely weakened by Jarasandha’s consistent attempt at annexing Mathura. Finally, Lord Krishna found it hard to stand the constant threat and avert an almost certain defeat. 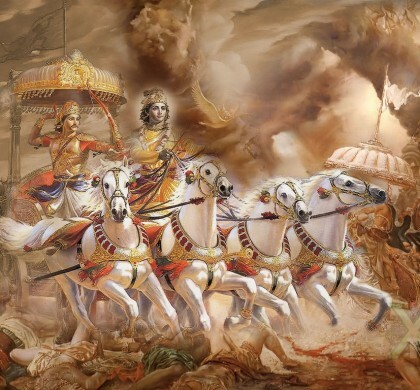 Therefore, he decided in favour of preservation of life over mindless valour and managed to convince his people to abandon the battlefield and flee, which is why Lord Krishna is also known as ‘Rannchhod’ (the ‘leaver of the battlefield’ or ‘the deserter’). Of course, the epithet ‘Rannchhod’ is by all means inglorious and it would be naïve to think that Lord Krishna could not have imagined such consequences. In those times, abandoning the battlefield was considered a despicable act of cowardice. However, Lord Krishna still preferred to flee over putting the life and welfare of his people at stake. It was a very pragmatic move completely out of line with the popular mores, but very much in accordance with the Supreme Law. Going to war with Jarasandha could only mean a certain defeat and the annexation of Mathura. It is honourable to lay one’s life in order to defend one’s nation, but the purpose of taking up arms should be the protection of one’s people and not for the mere display of one’s might, skill or valour. So, why would Lord Krishna advice his people to abandon their land and run away instead of fighting tooth and nail in defence of their honour? It is interesting to note that Lord Krishna does not identify ‘nation’ with land or territory but with the people. To protect one’s subjects is the primary duty of the king. Therefore, if a not-so-honourable choice has to be made in the interest of the security and welfare of the people, the king must not shirk from brushing aside the pull of his ego or self-respect. Of course, such a thought might have been thinkable but was never considered an honourable course to take by any kshatriya or king, for it does involve compromise of one’s dignity to a certain act. It, therefore, had to take someone of Lord Krishna’s standing to be able to put the welfare of the people before such concepts as ‘honour’ and ‘dignity’. For long, valour had been such a prized attribute to the kshatriyas that they had started putting it even above and before the well-being of the masses. Therefore, it had to be re-emphasized that the State is about the people and the king for them, and not the other way round. Lord Krishna took his people away safely and founded the city of Dwarka. This is how he secured his people, which, to him, was his primary duty. Lord Krishna is considered to be one of the greatest political strategists of the ancient times. By not fighting Jarasandha upfront, he not only ensured the preservation of his people, but also managed to avoid the weakening of his military capabilities, which was certain in the event of his fighting Jarasandha. However, Lord Krishna’s avoiding the battle did nothing to Jarasandha’s might, haughtiness or unjust ways. The tyrant had to be contained one way or the other, and annihilation was only possible way. He could not be defeated in battle. So, Lord Krishna decided to have him challenged by mighty Bhima for a duel. 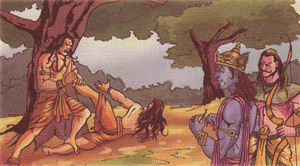 Jarasandha was physically very powerful, and to defeat and kill him in a duel was certainly not easy. Dressed up as saints, Lord Krishna, Arjuna and Bhima visit Jarasandha and request for a meeting in seclusion during evening hours. On meeting the trio, Jarasandha is convinced that they could not be Brahmins. They were certainly kshatriyas. Lord Krishna does not attempt hiding their identities when Jarasandha puts his doubt across. Jarasandha questions the legitimacy of the enmity itself saying that in all his deeds including detaining so many kings in his prison, he has acted justly because he acted in accordance with kshatriya traditions and conventions. The exchange between Lord Krishna and Jarasandha is quite illustrative of the confused understanding of righteousness. Jarasandha does not believe that he has violated the Supreme Law in his aggressive approach to stretch the boundaries of his kingdom, which, to his mind, is a perfectly legitimate exercise on part of a monarch. Lord Krishna, on the other hand, knows it very well that it is impossible to dissuade Jarasandha by words alone, for he is too arrogant to listen to reason. However, he does explain to Jarasandha as to why his position is untenable with regard to the Dharma and the prevailing principles of righteousness. There are several relevant principles that Jarasandha invokes in order to establish his claim of having adhered to the Dharma in his conduct as king, and many of the principles cannot be readily dismissed. All the arguments put forth by Jarasandha are convincingly countered by Lord Krishna, but it is the final defeat of Jarasandha at the hands of Bhima that settles the matter decisively. This might also be taken to mean that it is force alone that finally settles disputes regardless of one’s position vis-à-vismorality and righteousness. Originally published as part of THINKERS AND THEORY series in LAWYERS UPDATE in November 2013.